Okay so I'm sitting playing black 2, then all of a sudden this idea just pops into my head. "Hey I Know what theme Nintendo can do for the 6th Gen!" So I though it over, forget stuff, remembered stuff, thought up new stuff and so on. So I decided to type out my thoughts here. Feel free to leave comments suggestions and the like. For this first post, I will introduce the region, some background info, plot, and some game mechanics id add, bring back, get rid off. This new region for my Imaginary 6th gen is called ______(still working out names, I just really stink at naming). The region itself is made up of two Island continents, each a half of the Yin-Yang Symbol. As it may be the islands are very different from on another. The first Island, on the left, is an island of Industry, science and the betterment of man and Pokemon through technology. Steel, Fighting, Dark, Normal, and poison types are more common here than the second Island. It has many cities, factories and a few small towns. It has many mountains which are dotted with caves rich in minerals, so most cities are around the caves with the most Minerals. There are not many meadows, so grassy areas are not common. Since the people on this island are very technological, there are many advanced technologies, such as conveyers within cities, and bullet trains between the major centers. The people get their energy mainly from a nuclear power plant, but the smaller towns have opted for greener sources of energy such as solar and wind. They also have an advance form of the pokeball, called the Statusball (Info on it will be gave in the game mechanics section). The Island has one large lake, near the north, were most people get there water from. Legend says that the Pokemon of technology lives in the lake. The second Island in a 2 day journey by boat, and is to the right of the first Island. The people here believe more in nature and that the betterment of man and Pokemon are through understanding each other on a spiritual level. Grass, water, Bug, Ground, and psychic types are more common on this Island than the first. There are many small towns dotting the island, and one large city around the lake near the south. It has many open meadows and a small mountain range. Most of the towns are near he fertile meadows so that they can grow berries for them and there Pokemon. As such Berries are very common and easy to obtain from nature. The people here do use technology but they don't rely on them. Pokemon centers here use more natural remedy's. Energy here comes from solar, wind and small hydro plants dotting the island. The people here a special form of the pokeball, called Naturball ( again info will come later). The large lake in the south is home to the only city. There is also a legend of a Pokemon that sleeps in the lake, the Pokemon of nature. As stated early, the Island look like the two half's of the Yin yang symbol. However legend says that the two Islands were once one. The current ______ region came into existence after the people of the continent got into a war over how they were to proceed into the future. One side believed technology was the only way, while the other side believed understanding nature was the only way. Legend says that the two Pokemon Spirits of Technology and nature appeared after years of harsh fighting and separate the Island and the people in two, so that each side my proceed as they see fit. The plot this time around will be nature VS tech. There are two teams this time around, or again as some people may say. Team tech believes the people and Pokemon on the second Island are suffering without technology. They are trying to bring the advanced technology to them, but are meeting resistance from the locals. Team tech blames the Pokemon of nature for this supposed suffering. Team nature on the other end, believe the people and Pokemon are suffering due to their lack of nature. They believe this is because of the Pokemon of technology. Each side is trying to discover and awaken their legend as a way to end the supposed suffering on the other island. -> First off, each version of the game will have major differences. For starters, the two Islands will each have there own version. Gray Version for the technological Island, Brown Version for the Nature Island (I was gonna go green, but green was used for Gen 1 remake). Each version will have the same gym types, but the leaders will be different. Further more, the 8th gym will be a nod to the other version. -> each version will have a special form of the Pokeball. Gray version will have the Statusball, which increases the catch rate of a Pokemon by 10 percent if it has a status condition. Brown version will have Naturball, which increases the catch rate by 10 percent if the one of the Pokemon's typing is grass, water or ground. Does not stack if the Pokemon has 2 of the 3 types. -> I'm bringing back the Item storage for PC. Yes, I know we now have the free space pouch, But still, I don't know why i have to lug around X amount of the evolution stones or X amount of the shards ext. -> each version will have the same gym type for the first 7 gyms (although the leader will be different, but they will use the same Pokemon, regardless of version). The 8th gym will be a nod to the other version. EXAMPLE, the 8th gym in Gray version may be Grass, and steel in Brown version. Well I think that's a good wall of text For this post. Again, feel free to leave your comments, suggestions, or shake your head about how nuts I am for talking about a 6th Gen so soon. Next Post, the names of some of the major chars youll meet, YAAAY. Last edited by GofD on Thu May 16, 2013 10:33 am, edited 1 time in total. Seems like a pretty good idea to me. I particularly like the theme, and I love the way you treat sleep (seriously, how can someone be confused while asleep?) However, I don't like the NaturBall that much. Seems just like a Net Ball to me, only a bit stronger. Perhaps you could try something like a ball that works better at a specific terrain e.g. forest. Rudimentary responses. *sigh* Yes, I've actually been confused while sleeping. It hurts to think about. Anyway, I like the way you are thinking, GofD. However 'ood' it may be. I want a longer storyline!!! What about 32 badges and trainers with Pokemon over lvl80? And more boss and sidequests and stuff! Because now it's "I finish the game and that's it". But you sure have great ideas! Glad you like the way things are going so far. @ChillBill- Hmm, I see what you mean, now that you've mention it. I think I might think it over and maybe change the ball. @Samurott- That is precisely why I did that. I can understand being confused AFTER you wake up, but when your asleep? @GhostPony- Thank you, I'm glad you like them! You'll have to wait on the storyline, That will come with the "walkthrough" later on. Right now is the bread and butter stuff. I do hope I can meet your expectations with the storyline though! And now for some of the MAJOR chars you'll be seeing! Here the Prof (in this case PROFS) will be introduced as well as your rival, important figures in Team Tech and Team Nature, As well as the 8th gym leaders and Champion (they have a larger role to play in this gen). The elite 4 will come later and the 7 gym leaders will be revealed when I describe the towns and cities. First up, since there are 2 versions of Gen 6, there will also be 2 Profs, one for each side. In this case the Profs are gonna be twins, and they will still follow the same naming as past generations. As in they will be named after a tree. ->The Prof on the left island (Tech) is named Professor Joshua (Joshua is a type of desert tree.) and is a 20 ish year old male. He is tall, slender build with black hair and a blonde highlight. He is rather serious looking, and takes his work very seriously. His research is mainly on how we can better Pokemon through Science and Tech. He does treat Pokemon well and will not put them through anything he deems unsafe or painful. That said, he gets quite angry when people mistreat there Pokemon. ->The Prof on the right island (Nature) is named Professor Maple ( I'm Canadian, I couldn't help myself). and is a 20 ish year old female. She is also rather tall with a slender build. She has blonde hair and a black highlight and wears glasses. She is rather forgetful and is kinda free spirited, running off to do her on thing. Her research is manly on the bonds between Pokemon and Trainer, and they are used to make both better. Like her brother, she gets rather upset when she see's Pokemon being mistreated. Next up, the Leaders of the two Teams. First up some Important chars in Team Tech. Those playing Brown version will see these people more than those playing gray. ->Leader Cy is a 40ish year old man, rather tall and bulky, Short well kept silver hair, and a robotic left eye and hand. He believes strongly that technology is the best path of Humanity and Pokemon. He believes those who do not embrace this path are mislead and suffer greatly due to nature and its misgivings, such and floods, forest fires and the like. He plans to Unite both islands under the power of the Legendary Pokemon of Tech, and make the 2 islands whole once again. -> LT. Mark is more machine than Human after being caught in a major fire on the right island. The Doctors over there didn't give him a high chance to walk, let alone live. However after being approached by Cy, leader of Team tech, who promised him new life, he quickly agreed to an experimental procedure on the left island. Since then, 75 percent of his body is now machine related. He mostly wears a long cloak and a mask. He is very loyal to Cy and his cause. -> Simply known as #9, not much is know about the tall, black haired well dressed spy of Team Tech. What is know is that he is a master of Dark type Pokemon, and an excellent safe cracker. For those playing Gray version, your more likely to see these people, from Team Nature. -> Leader Clemintin is a 40ish year old women who was forced to work in an illegal factory on the left island. Horrified of what she saw here she vowed to destroy technology and return the island to its former natural self. She is rather short, but is in very good shape with graying black hair. She wears long dresses made by Leavanny using natural material from the right island. -> Old lady Gretel is a in her 70's, but don't let her age fool you. She's a highly skilled trainer of both psychic and ghost Pokemon. She claims that she is able to communicate with nature, and that nature is angry at the people for turning its back on it. Most people believe shes just crazy, but the members of Team Nature highly respect her. Clemintin is known to ask her for advice. -> Mr.Nature as he is known, lives in the mountains of the right island, where most people dare not travel. He has a deep distrust of technology and believes it weakens the heart of trainer and Pokemon. His age isn't know but some believe he is in his 70's although it looks more like he's in his late 30's, attributed to his life in his mountains. He is rather tall, strong built, and has short brown hair. He joined Team nature to ensure not only his mountain home is not disturbed, but to show those who believe in technology how foolish they really are. The 8th gym leaders are located in the major cities of their respected Island. Gray version will have its leader as Lizith, Brown version will have its leader as Garth. 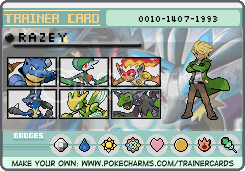 -> Garth is the Gym leader in Farmcentral the only city on the right island. He was originally from the left island, but moved to the right island. He strongly believes that the best way forward for people and Pokemon is a combination of Technology and nature. He is in his early 30's and is rather tanned from working in the hot sun. He is a rather inventive person, but focuses on finding new ways to grow, harvest and create new berries. He is also a well known blacksmith on the Island, people come from all over to see his work. He is a Steel type Gym Leader. And now, for the Champion. The champions name is, drum role please........DAD! That's right the champion is your Father! He and your mother live in the island that's between and to the north of the 2 islands where the Pokemon League is located, also known as Peace Island. The people who live here cooperate with both technology and nature, and don't pay much attention to what the two other islands are doing. However with the recent activity of Team Tech and Team Nature, your Dad, the champion has decided its time for him to look into whats going on. He uses a combination of types and is a fun loving person, but knows when its time to get serious and down to business. He has taught you and your Sister/Brother (depending on the gender you choose)to be kind to your Pokemon and that just because someone believes in on thing and you believe in another, that that is not a reason to despise that person, but to embrace and discuss your differences and work together for the future. And there you have it! Those are the major players in this Gen. Yes I know its another LARGE wall of text. and after your done reading it your probably gonna say: "HEY? WHERE'S OUR RIVAL!" All I'm gonna say on that is read the last paragraph again and maybe in between the lines a bit. Next time, I will introduce the starters and the legendaries (that can be caught in game without the use of mystery gift). I'm just gonna tell you right now Im looking and a total of 6-7 NEW legendaries being split between the 2 games, something like ONE that can be caught in both, and THREE that are version exclusive. Also if anyone has any ideas on maybe the name of the region, or maybe some better team names, or ideas in general, don't be afraid to say them! I welcome the ideas. Cant help but think Reshiram, Zekrom & Kyurem would of been the perfect legendary trio for this type of map. @CrazyRazy- yeah I see what ya mean. They could work, but the typing would have to be changed. Well after 3 hours of typing , my computer decided to freeze and I had to do a force shut down. Lost all those 3 hours of typing. So I had to retype it all(should have copied and paste it into Notepad ever so often). Yay me. Anyways, This post will contain the info for the Starters and there evolutions, i'll save the legends for later to save a mass of wall of text since this one will have info on about, oooooh, 15 pokes. Now before I get into the info on the specific pokes, a little info behind my thought process. I decided to to keep the Fire/water/grass types. Grass came easiest to me, Panda. I don't know why A Panda, But I felt we needed a change from the reptilian look of the grass types. Fire was a little harder, it was between snake and insect. I had an awesome idea for the snake evolution on the left island, however on the left side I found it felt too much like a rehash of Ekans and Arbok for his first two stages, so I decided to go with insect. Water isn't so flashy, a water droplet. I decided to go that path, since water seems to have more diversity in the "species". NOTE: The 3 starters will be the same on each Island, HOWEVER, there evolutionary path will depend on which island(version you play). Description-Looks like a small caterpillar covered in bright orange Fuzz, has 6 short stubby black legs and bright green compound eyes,has no visible mouth or nose. Pokedex- Although rather small and weak, this Pokemon makes it home if the embers after a major forest fire. Description- Oval in shape, looks like steel, VERY shiny, has many small sharp bards, and two small red eyes near the top. Pokedex- Lives in the molten steel of factories. It does not eat or drink as it awaits evolution. Simple version-Increases DEF While decreases Speed growth. Detailed-Increases Defense and Sp.Def growth by 50% while decreases speed growth by 75%. Description- A giant stag beetle covered in a steel shell, with flames coming out of any weak spots. Has giant jaws, about 10m long. Has short, stocky legs with flames on the tips. Has 2 red eyes behind its jaws on either side of its trapezoidal head. Pokedex- Eats Iron ore all day long. Its internal body system turns it into steel. Simple version-Increases Def when hit with water. Detailed- When this Pokemon is hit with a water type move, its Defense increases by one stage and its speed decreases by one stage. Simple version-Sends out a wave of Molten iron causing burns. Detailed version- Sends out a wave of molten iron damaging the opponents Pokemon. Has a 100% chance to cause a Burn. Is Super Effective against Steel and Grass types even though it is a steel type move. Description- Looks like a child sized praying mantis, with a Light orange body and red forelimbs. Has yellowish and reddish eyes on the side of its head. Pokedex- The Forelimbs of Smoldtis emit heat. The reason for this is still unknown. Description- A giant bright orange colored praying mantis with yellow strips. Its forelimbs are covered in a bright red flame. HAs bright red and yellow eyes on the sides of his head. Pokedex- The flames on its forelimbs or so hot, they can cut though solid steel. Simple version-Cause the defending Pokemon to be burned. Detailed-Upon entering battle with this Pokemon, the opponents Pokemon is inflicted with the burn status. Simple version- Squeezes and causes massive damage if burned. Detailed- The Defending Pokemon is Squeezed in the Forelimbs to cause damage. Base power doubles if the Pokemon is Burned. Description-Looks like a baby panda, bright Green in Color, with small stalks of bamboo growing out of its back. Pokedex- Likes to walk about. The growth speed of the bamboo depends on location. Description- Teenage sized sized panda on two legs, carries a large bamboo poll on its back. Is a duller green than Pandboo, and the bamboo on his back is shorter. Pokedex- It uses the pole on its back to train itself to become stronger. Simple Version- Accuracy can not be lowered. Detailed- Accuracy can not be lowered by attacks by the opponent. Users attacks that lower HIS OWN accuracy will still have effect. Description- Tall as two grown men, with the males wearing Sunglasses, the females don't and a "look at me wrong and i'll smack you" look. Its a very dull green, with bamboo around his wrist to increase his punches. Bamboo no longer grows on his back. Pokedex- The males prefer to be solitary while the Females are more social. Simple version- Gains Immunity to poison when hit by poison. Detailed-The Pokemon Gains an Immunity to poison type moves when hit by a poison type move, but loses its grass type. Simple version-Deals a Massive left hook, which also heals the user. Detailed- Deals damage by using a powerful left hook. The user heals itself by half the damge given to the defending pokemon. Description- Teenage sized Panda on all fours, rather heavy, and a darker green color. It has many tall bamboo stalks on his back. Pokedex- The Bamboo on the Pokemon's help to nourish it through photosynthesis. Description-A rather large, school bus sized panda, with a large forest of Bamboo on his back. Looks rather laid back. Is a very very dark green color. Pokedex- The Forest of bamboo on his back provides all the nutrients this Pokemon needs. Detailed- Increases the Pokemon's Defense and Sp.Defense by 1 stage each turn. Simple Version-Throws spears of bamboo at the enemy. Description- Looks like a living water droplet, with yellow eyes and mouth. Is about the size of small cat, with arms and legs. Pokedex- A Living water droplet, is rather mischievous. Description-Looks like a Little girl made of water. Emits a light purple arua, with a blue body and a small yellow eyes. Pokedex- This Pokemon is said to stand on the edge of a bay and stare into the ocean. Description- Looks like a mermaid made of water. Emits a very bright pink Aura and has 2 glowing yellow eyes. Pokedex- It is said this Pokemon uses its psychic powers to pull people on shore into the ocean. Simple version-Weight increases when hit with water. Detailed- When this Pokemon is hit by a water type move its weight increases by 2%. Simple version- Base power is an average of all the last moves used. Detailed- The base power of this move is the average of all the past moves in turn that was used before this Pokemon. Hits every Pokemon on the field of play. If this Pokemon goes first, Base power is 0. Description- Looks like a human sized water droplet, Has no legs but rather larger arms. Eyes are a Dark Blue, as is its huge Mouth. Pokedex- It is said when this Pokemon feeds on a source of water, the water is safe to consume. Simple version- Traps Water type Pokemon. Detailed- If the Pokemon is Water type, it can not run away. FIELD EFFECT- Increases the appearance of water type pokemon. Description- A giant blob of water with larger clawed hands. Only has a large, dark blue mouth. Simple Version-Increases damage of water type moves after another. Detailed-When this Pokemon uses a Water type move, the next water type move's Base Power will double. Simple version- Changes all Pokemon's type in play to water. Detailed version- Launches a large wave of water at all Pokemon on the field. After Damage is, the Pokemon damaged type is changed to water. And there you have it! Your starters and there Evolution! This took me 6 hours, and I hope they stack up to your expectations! Next time I shall introduce you to the 7 legendaries in this game. And Hopefully, it wont take me 6 hours to get it typed out! Nice! A series of starters quite different than those we've seen before. You should PM Masuda . Wow, thanks, GofD. You threw the water starters under the bus, imo. Ps. I decided to put a little color in my posts, since everyone seems to use one, and in other forums I use colors. So it will be "Light Steel Blue". Edit: Red text, my eyes!!! @ChillBill- Thanks, I'm glad you approve of them. And maybe I will PM Masuda! @Samurott- I'm sorry the water types didn't live up to your expectations. I may have not conveyed them well enough. If you have an idea to replace them, Don't be shy and go ahead and post them! Who knows, I might do a poll to see which versions people like better! @Ghostpony- Glad you enjoy it! And sorry for the red text, now that I look at it, it is a little hard to read. I know its only been two posts since my last post, and not even 24 hours. But truth be told, I kinda wanted to the starters and Legendaries together, Since they are sorta the big mascots and such. But due to technical Difficulties and time, I could only get the starters in. So, this post will be of the 7 legendaries in this gen. My thinking behind these came in spurts, rather than all at once. I actually came up with one of the minor legendaries for Gray Version before anything else! The trio, this time around are gonna be wolf -like spirits. I figure we need a break from the "legendary dragons". All three will have the ghost type, and one other(given later). Now for the 4 Minor legendaries (2 per version). Spoiler, one of them will be a poison type. Yes poison types are gettin some love from me. The Format of how I introduce them will follow what I did for starters. However, in line one I will also include where you meet them. Description- Looks like a great white Wolf, with multiple Tails (3). It has brown around the eyes, tip of the tails, around the feet and outlines the ears. It has a regal appearance, but also looks rather motherly. There is a build up of fur around the neck and shoulders. Its eyes are black in color, but seem to shimmer with hope. Pokedex- The legendary Pokemon of the_____ Region. It is said each tail represents a different Ideal. Simple Version-Stares at the opponents soul. Detailed- Stares into the opponents Pokemon Soul to cause flinching with a 30% chance. This does not affect the flinch rate of moves. Simple version-A loud Soul shaking howl that requires a recover time. Detailed-Uses a loud howl that shocks the opponents soul. Has a 100% chance to flinch the opponent. Requires a recharge turn. Description-Looks like a giant gray Wolf. Has a bit of a shine in it. There is Blue around its eyes, Tip of its tail, around the paws and outlining its ears. Has thin blades coming from its front shoulders. Has an intelligent look to it, however also rather smug. Eyes are yellow, and seem determined. Has a light blue aura around it. Pokedex- The legendary Pokemon of the Left Island. Is the spirit of Technological Ideals. Simple version-Makes changes to stats as the opponent does. Detailed- As the opponent Pokemon raises/ lowers it stats, this Pokemon raises and lowers its stats depending on the stats changed by the opponent Pokemon. EXAMPLE: The opponent Pokemon's Attack is raised by one stage, this Pokemon's Defense is raised by one stage. Simple version-A Howl with the knowledge of technology. Requires recharge after use. Detailed- The user lets out a howl embedded with the knowledge of technology. The user needs a recharge on the next turn. Description- Looks like a giant green wolf. Has Yellow around its eyes, tip of its tail, around its paws , and outlines its ears. Has a Calm, yet smug look. Flowering shrubs sprout out of its shoulders. Eyes are blue and seem to be determined. Has a light yellow aura to it. Pokedex- The legendary Pokemon of the right island. Is the spirit of natural ideals. Simple version-A howl with the knowledge of nature. Requires recharge after use. Detailed-The user lets out a howl embedded with the knowledge of nature. The user needs a recharge on the next turn. Description- Looks like a Giant purple Cone snail with what appears to be a nuclear reactor for a shell. Has a bit of Yellow on its eye(?) stalks. Pokedex- An extremely dangerous Pokemon. Is not recommended to be caught. Detailed. When this Pokemon's Hp it taken to 0 due to an opponents attack or status condition, this Pokemon use the move Explode. Hits all Pokemon in play but ghost types. Description- Looks like a Giant lotus.Is dark green in color, with black splotches only its back and wing covers. Pokedex- Has an appetite 10x that of a Snorlax, and is about 10x as active. Simply Version- Bug type moves get a major boost. Detailed- When this Pokemon uses a bug type move, it receives a 75 percent boost in power. Description- A giant made from electricity. Is yellow in color, With bright blue eyes and mouth. Pokedex- A Pokemon created after an accident at a power plant. Causes major blackouts by absorbing electricity. Description- A giant made of ice. Is a pale blue in color and has red eyes and mouth. Pokedex- A that devours ice. If the Pokemon runs out of Ice to eat, it will go into a rage. Simple version- Freezes on contact. Detailed- If the opponent Pokemon directly attacks this Pokemon, there is a 10 percent chance for that Pokemon to be Frozen. FIELD EFFECT: Increases encounter rate of ice type Pokemon. And there you have it! Your 7 legends for this gen. I really hope you guys enjoy these ones. I'm probably gonna take a one day break before posting some more stuff. In my next post, BERRIES! Something simple, and hopefully not so much a wall of text as my other ones. EDIT: Thanks to ChillBill for pointing out a few things that needed fixing. Nature Howl now has Base Power and accuracy. Tech Howl and Nature Howl's Base Power has been raised to 150, And the freeze chance on Iceybody has been dropped from 30% to 10%. Last edited by GofD on Tue Jan 01, 2013 5:19 pm, edited 1 time in total. Nature Howl has no Pow/Acc (I guess they're the same as Tech Howl?). Tech Howl (and Nature Howl if it is the same) seem like pretty weak moves to need recharge. Unless there is something about the knowledge of tech/nature I didn't get. Also, about Iceytouch. I understand why you used that, but remember that freezing is the most powerful disrupt in the game, and its base chance of occuring is almost always around 10%. Perhaps you should lower your chance, too, otherwise it might be considered overpowered. These ideas are really good and definently better than anything I could come up with. Just one comment about Tech Howl; it just doesn't make much sense to me how a howl would be a physical attack unless the howl turns into solid metal? If you could just maybe clarify that it would be great. I'm looking forward to what you type up next. Really great idea! I always wondered why there weren't any wolves in pokemon games. And I like the idea of ghost type for them. Ok, I know i said I was gonna take a break today, but i finished the stuff on the berries. So I might as well post it! @CrazyRazey- Nothing would happen, it would just continue to lvl and NOT evolve to the next stage. Sorry! -Until you get to a certain point in the game, Cheri, Aspear, Chesto, Leppa, Oran, Pecha, Rawst,and Sitrus berries will be the only attainable berries, UNTIL you get to the certain point in the game, you will be able to obtain the rest of the berries. - The berries mentioned above are the only ones to be found on plants (OR Pokemon) on the map and the berries can not be planted. Berries will be able to be planted at a specific area in both versions. -Berries that heal Hp or PP will now have a maximum Hp/PP that they can heal (as in if a Pokemon uses the berries, they will heal anywhere from 1 to the max Hp/PP the berry is allowed). -Berries grown in gray version will produce more berries(25% more than normal), but will have a lesser chance(-25%) to heal the maximum Hp allowed, and negative secondary effects of the berry have a greater chance (+25%) to occur(such as the chance to confuse as on the mago berry). Berries grown in Brown version will produce less berries(-25% than normal), but will have a greater chance(+25%) to heal the maximum amount of Hp allowed by a berry, and negative secondary effects of the berry will be less(-25%). -The two places you can grow the berries are: In gray version, at the BERRY RESEARCH LAB. In Brown version, U-GROW FARM. Here players will be able to plant and grow there berries. The Berries mentioned above will have a 24 hour growth cycle. This means within 24 hours of planting, you will have your berries. All other berries will have a 48 hr growth cycle (unless other wise mentioned). -Each of the two places mentioned above will have the following people: A berry manic who will give you one random berry a day. A person who when talked to will tell you how to grow berries, and another who will explain pollination. -You will now be able to pollinate your berry plants to make new berries (NOTE: Pollination will ONLY result in making the new berries released in this Gen). To pollinate, you will need the Key item: Pollen Tube. To use the pollen tube, walk up to a plant that is in bloom and press "A". You will be asked if you want to collect its pollen. After collecting the pollen of one plant, walk up to a different plant and press "A". You will be asked if you want to dust the plant with the pollen. There are three possibilities when you pollinate a plant. It will either have no effect (plant will produce its normal berries), the plant is unable to produce berries (Plant dies with out producing berries, 35% chance) or the plant will produce 1 new species of berry. Revive Berry, When held, Restores 50% of a fainted Pokemon's HP and has a chance to confuse (35%) the user, Aguav+ Mago, 5%, 120hr (NOTE: No matter what version you play, there is only a 25% chance that the berry plant will produce 2 berries). And there you have it. I know I only released 10 new berries, But there really isn't much else I can do for there effects in my opinion. These 10 are what stood out in my mind, that and I had a difficult time thinking up the last 2. Again, if you have any questions or comments, about ANYTHING, that I've written don't be afraid to post them. Also I have started up on the Pokemon List. No idea when Ill get some of that list up. I can see where you are coming from on the Tech Howl. And besides, it's your design. Do you mean the start of battle or when the Pokemon enters the battle? If you mean the start of the battle it greatly decreases the berry's usefulness, in my opinion at least. Sorry if it seems like I'm nitpicking, but I can't help it. Its ok if you nitpick, I honestly don't mind. It shows your interested. Now to your question, By START I mean when it ENTERS battle. I'm sorry if that threw you off. 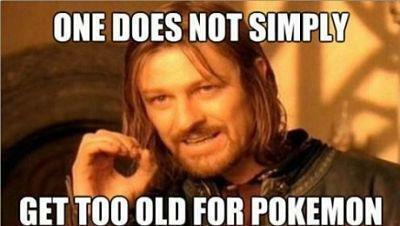 For the Pokemon, if you hesitate on picking a pokemon, it will never end. So make a list of all your ideas and post them. If we don't like something we are just going to tell you. Maybe the The Fake Movedex could help you with the TM! @ Ghost Pony- Thanks for the tips! And I'm well aware that if you don't like a Pokemon, you guys are gonna tell me. Please just leave the pitch forks at home. Today's post will introduce you to 3 Pokemon (and there evolutions) that you will encounter early in the game. ENJOY! **NOTE: Instead of saying left Island, right Island, Ill simply use Gray Version, Brown Version. I think I MAY be causing confusion. Description- Looks like a light purple blob, with two small black eyes. Occaisonly small sparks of electricity goes over its body. Pokedex- A Pokemon made completly of posion fluid. Seems to have difficult keeping its blob like form. Description- A larger darker purple blob, with more frequent, and larger sparks of electicity over its body. Has medium Sized black eyes. Pokedex- The Pokemon requires a large amount of electricty to keep its form. It often causes blackouts in small towns. Description- Large amount of dark purple smoke in the center of a ball of sparking blue electrical bolts. The purple smoke, seems to move around inside the electrical ball. Two Large menacing black eyes float in the middle of the dark purple smoke. Floats in the air. Pokedex- The Poison gases that make up its body creates so much electricty that it is known to short out electrical systems it comes in contact with. Detailed- When this pokemon is attacked directly, there is a 30% chance that the attacker will be paralyzed or poisoned(50/50). If the pokemon has the ability Limber, it will be poisoned. If the pokemon has the ability Immunity it will be paralyzed. Description- Looks like a little red flower bud. 3 small green vines are underneath that act as feet. The Bud OCCASIONALY splits open wide enough to see 2 neon green eyes, but snaps close rather rapidly. Pokedex-The Pokemon emits a small amount of heat. The bud seems to remain close as it waits evolution. Description- The Bud is now larger and more oblong like in appearance. Appears to be breathing, with every "exhale" a small flame can be seen from the top. There are small yellow petals at the base of the bud. The 3 vine like feet are longer and thicker and have small thorns on them. Pokedex- The Pokemon roots itself in a forest with its vine like feet. It then proceeds to burn the forest for food. Description- A large red flaming rose. It has two neon green eyes in the middles of the flower. The flower is supported on a long thorny stem leads with 2 razor sharp leaves. The steam sends in 3 very thick vines, that have extremely large thorns. Pokedex- Kept for its everlastig buetay, this Pokemon is also know to spark massive fires as it's petals drop. Simple Version-Scatters flameing petals around the foe. May Cause a Burn. Detailed- The user scatters many flaming Petals around the opponent. There is a 35% chance that this move will burn the opponent. Descrptions- A Ratatta sized flying squirell, light brown in color. Has a rather small bushy tail. The folds between its legs are rather large for its size. Pokedex- This pokemon has trouble walking since its always tripping over the folds of skin it tries to use for gliding. Description- A Child sized squirell sanding on its hind legs. Dark/Light brown in color, with an out of perportion small bushy tail. Is wrapped up in its out of perportion HUGE skin folds. (sorta looks like a squirell in a burritto). Pokedex- Its Huge skin folds prevent it from being able to glide. They do however, make an excellent parachute. On a side note, I'm having a bit of difficulty deciding what Tm's to boot. I know snarl is out for sure, but other than that, I'm stumped. Input would be greatly appreciated! EDIT- Suction Cups has been replaced with Chlorophyll on Roseferno. Last edited by GofD on Fri Jan 04, 2013 11:27 am, edited 2 times in total. Ah... Grass/Fire... I was waiting for this combo!!! Actually, I don't know what is the current TM list for B/W. So I can't really help you for this. Ps. There's already Sentret as a flying squirell, bit I believe it will be fine! Berries: That Raspfurry Berry... I want it!!! I'm not sure about Astro... If there is one of this kind, then there should be additionals for each type (water immunity, grass immunity etc.) Did you plan something about these? Pokemon: That Fire Rose draws me... (thinking competitively, it would be a great addition to a Drought team). A really good idea. Your blob seems pretty nice. Now the squirrel... it seems funny for sure. And, GP, Sentret is not a flying squirrel. It's a scout. DON'T. MAKE. EEVEELUTIONS. Seriously, we have seven. Aren't they enough? Farfetch'd... A long, painful story. Same with Dunsparce. They NEED an evolution. Don't bother with disappointment. Give us your ideas. As for TMs... Take out Frost Breath and Struggle Bug. Also, you could demote Dive to an HM. Add Nasty Plot, since its counterpart, Swords Dance, is already in. Agility would make for a fine addition too. For others, follow GP's advice-the Fake Movedex is a good idea. My mind keeps revolving around a metagame with these berries and the Fire Rose... It would be crazy. Especially if Roseferno kept Chlorophyll. Well, we'll make it its DW ability! @Chillbill But this Rose is awesome!!! I already have a competitive moveset for this one. Wow..... the response to this thread is just amazing! I never really expected so much interest! @ChillBill- *FACEPALM* OF COURSE! Berries that give a Pokemon Immunity to types! Cant believe I didn't think/ see that. As soon as I think up some names, I'll post the berries. And I'm glad you like you like Roseferno! Also thanks for the suggestions with the Tm's, And Im guessing you mean make Dive a Tm instead of a Hm? And yes, 7 Evolutions of Eevee is enough. @GhostPony- Well, Well well, someone else seems to like Roseferno, already making a moveset I see. I actually really like that moveset to be honest. I also REALLY like you idea for an ability, I might just use it! And also, THANK YOU! Honestly, thank you all for your input. Like I said I never expected this much interest! I really hope I can keep delivering some good stuff for you guys! Well, then again, the only difference between TMs and HMs now are that TMs can be deleted. Also, I thought of Team names in case you may be struggling with that area. For Brown Version, Team Tech. Generic, yes, but my only other ideas were Dubstep, Techno, and, a Saint's Row The Third reference, Deckers. This is the team that prefers technology over nature. Their colors could be like a muave and midnight blue. For the other Team, I was thinking Team Dryad. Since a dryad is a creature that resembles and can change into a tree, and they are represented as defenders of nature, why not? Their colors would be a saturated dark green, possibly forest green, and a dirty blue.